Swift TG Solutions has extensive experience in the Oil & Gas industry with services that make oil and gas production more efficient. Through detailed analysis, design, testing, optimisation and know how, we deliver real world solutions that offer immediate return on investment. 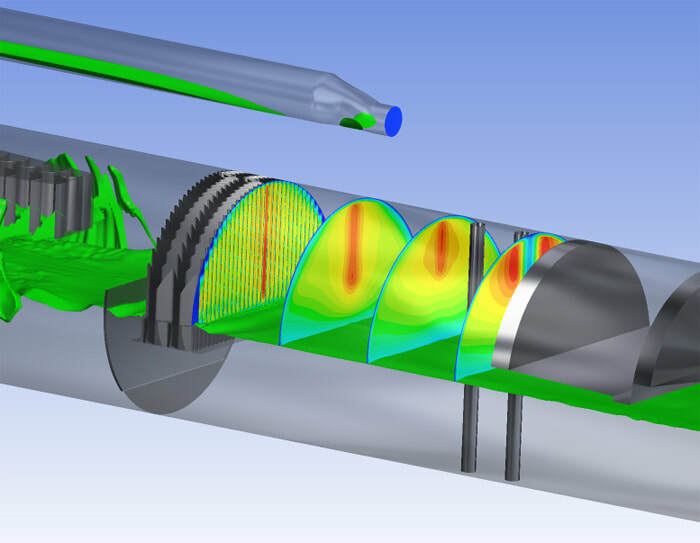 To accomplish this we can carry out full process system reviews, research and development in our in-house scaled flow facility, computational fluid dynamics (CFD) simulations and hardware supply. Our main area of expertise is in the field of fluid separation encompassing both new and de-bottlenecking applications, topsides and subsea. Swift TG Solutions focus on innovative techniques through our continued investment into research and technology and we have a full understanding of the production process, advanced software capabilities and in-house test facilities. Applications to vessels (for example. separators and mass transfer columns) and other process equipment (for example, pumps, flow meters and valves) : Flow and residence time verification, the presence of maldistribution due to the inlet pipe configuration, impact of slugging at the feed, the effect of motion and fluid sloshing, determination of mechanical loading on internal components and the pressure containing envelope, prediction of efficiency.